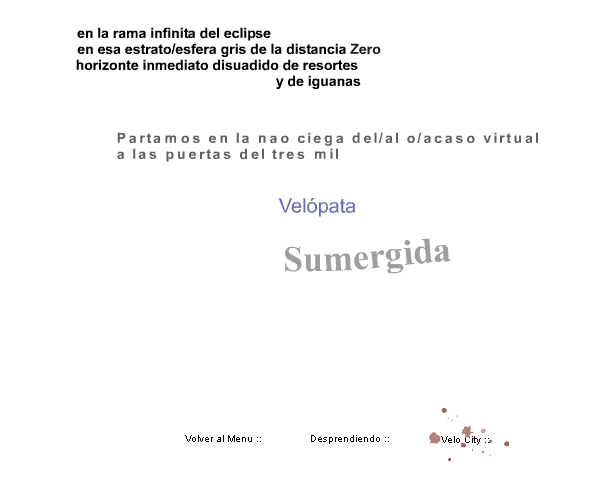 Velo City is a hyperpoem that uses hypertext links and Flash animations. It's focus is on the speed of the internet itself, where we can travel through cyberspace moving almost instantaneously to anywhere on the planet. Initially the word "Sumergida" (submerged, sunk or immersed) slowly descends diagonally. Behind it a trio develops: "en la rama infinita del eclipse/ en esa estrato/esfera gris de la distancia Zero/ horizonte inmediato disuadido de resortes y de iguanas." The word ""Sumergida" literally sinks to the bottom of the screen. Then comes a second verse: "Partamos en la nao ciega del /al o/ acaso virtual/ a las puertas del milenio." The word "ciega" (blind) is colored and is a link taht leads the reader to browse the following pages, where coloured links also appear. On each page the words dance from one side to another to write sentences and verses. Neologisms are highlighted in green: "velófila, velógamo, velómano". When clicked on, the letters fall apart and pull together. Of note is the valuable integration between visual and textual aspects of the poem. Typrography and the meaning of the words enhance and enrich its meaning and the message and emotion of the poem.